Police have made a fresh appeal to trace four men over "violent disorder" an hour before the Leicester City helicopter crash. 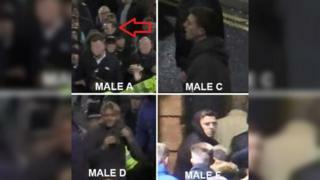 CCTV images of six men officers wanted to speak to were released last month and two have now been identified. Leicestershire Police said the two men were "assisting with inquiries". Seven other men, from Leicester and London, have been arrested in connection with the fight on 27 October. Six remain on police bail. Police said "a number of people" were involved in the brawl at about 19:30 GMT near the King Power Stadium, following the Leicester City and West Ham United match. CCTV captured the fight in Filbert Way, near the junction with Burnmoor Street. Det Con Jack Thomas said: "While no-one has reported being injured, the actions of those responsible are unacceptable. "A number of people, including families with young children, were leaving the stadium after the match. "The appeal we issued last month did lead to two of the men in the CCTV images being identified, however we still wish to identify the remaining four as they may be able to assist with our inquiries." The helicopter spun out of control near the stadium at 20:37 after a mechanism became disconnected, killing Leicester City's chairman Vichai Srivaddhanaprabha and four others.